– Spray a little olive oil spray on a sauce pan and heat on low. 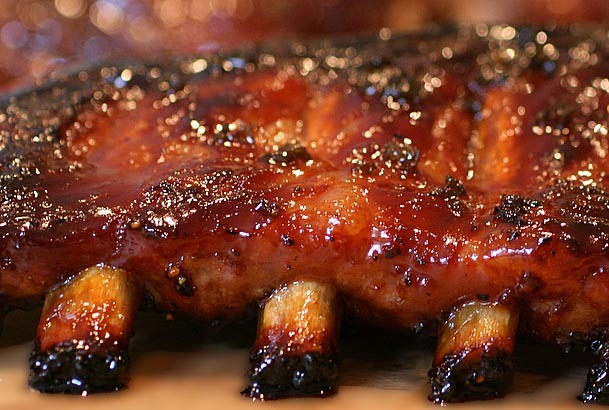 Once the pan is hot, combine all the Remedy Ribs Marinade Glaze ingredients in the sauce pan, and gently stir. Allow to simmer for 10 minutes. – Gas grill instructions: Turn one half of the grill to medium-high, & the other half on low. Place the ribs on the low heat side of the grill, turning every 15 minutes for 1 hour. 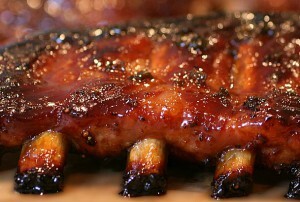 Apply more glaze, brushing on, and continue cooking for another 30 minutes, turning the ribs every 10 minutes. Allow to cool for 1 minute, & serve. Place the 4 inch pieces of all the vegetables into a large tupperware or tin, with 2 tbsp olive oil, 3 tbsp Cardini’s Light Balsamic Vinaigrette Dressing, & 1 teaspoon finely minced garlic, mixing well, thoroughly coating the vegetables. For best results, allow to marinate overnight. 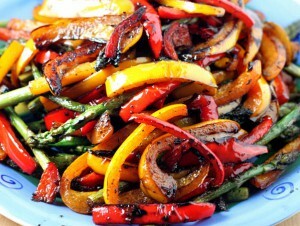 Place all vegetables in the grill cage and place on the medium-high temperature side of either gas or charcoal grill. Cook for 12 minutes, turning the cage every 3 minutes. Allow to cool for 1 minute & serve. Special Treat! Remedy Recipes Guac-Dip!!! Great for BBQ’s!!! 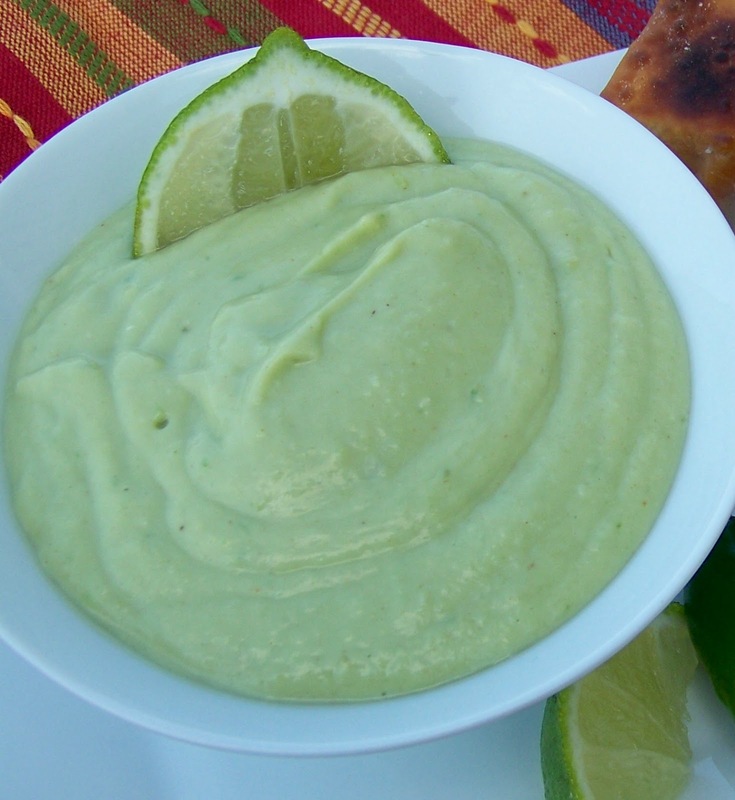 Ingredients: 1 ripe avocado, 1 cup Plain Non Fat Greek Yogurt, 1 teaspoon minced cilantro, & a squeeze of fresh cut lime! Instructions: Mash avocado, and mix with the other ingredients. Serve with sliced veggies such as cucumber, celery, peppers, & zucchini, or serve with Lundberg’s or Rice Works Brown Rice Chips! All three of these scrumptious items are perfect for Summertime BBQ’s! The Remedy Ribs practically fall off of the bone, the Grilled Balsamic Vegetables are tender & flavorful, & the Remedy Recipes Guac-Dip is light & refreshing! The Remedy Ribs & Grilled Balsamic Vegetables may be used as Meal 4 on the Remedy Recipes book format. (To use these items for Meals 2 or 3, simply add some grilled sweet potato alongside, (1/2 large sweet potato for women, 1 large sweet potato for men.) Remedy Ribs portion: 4 oz. for women, 8 oz. for men, (the bones add weight to the measurement.) Grilled Balsamic Vegetables portion: 2 cups mixture for both men & women. The Remedy Recipes Guac-Dip may be used as an evening snack, 2 heaping tbsp with sliced cucumber, pepper, celery, or zucchini, or use as a vegetable serving, (1/2 cup for women, 1 cup for men) in Meals 2 or 3 along with Lundberg’s or Rice Works Brown Rice Chips (as a carbohydrate- 6-8 chips for women, 10-12 chips for men,) for dipping. The Remedy Recipes Guac-Dip is a great appetizer to bring along to any party! Try it with Lundberg’s Fiesta Lime Brown Rice Chips- a perfect combination! I hope you enjoy these tasty items! The Remedy Ribs are worth the time it takes to prep & cook! 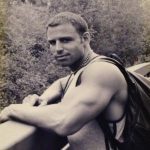 Just put on some good music, enjoy a glass of cold lemon water or homemade stevia-sweetened iced tea, turn those ribs as I suggested, & you’ll be enjoying them shortly. Mangiare, Piaccia! Eat, Enjoy!